In my last post about menu planning I mentioned that I would be serving a buttermilk lemon cake with a bittersweet chocolate sauce for dessert. The cake recipe actually calls for a lemon glaze topping. I've made it that way and can attest to its deliciousness. But this time around I wanted to see if the subtle lemon flavors in this lightly-textured cake could complement the more complex flavors of passionfruit and dark chocolate. With a jar of Renee Suzette's bittersweet seduction chocolate sauce on hand I thought I'd give it a try. Well, why did I wonder? Truthfully this sauce, which I defy anyone from taking spoonfuls directly from jar to mouth, would go beautifully with any pound cake recipe. I can even envision it served atop banana bread (instead of baking chocolate chips in the banana bread, for example). And though arguments can be made for going for "full cake coverage" I think that a restrained drizzle provides all the decadence you need. It isn't that it would be too sweet (this is not like the cloyingly sweet chocolate syrups you'll find in the supermarket aisle--this is basically ganache in a jar). But because it is basically ganache in a jar, I'm inclined to take it easy. Love, love, love this! See...this is what I'm talking about! 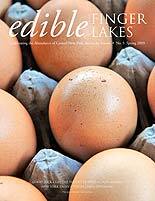 Renee Suzette's Chocolates are available online from her website and at select wineries and shops. Statement of disclosure: This jar was given to me by Renee Suzette Daldry with no request or expectation of a review or endorsement. New producers continue to arrive selling amazing cheeses, meats, and breads. And so it is that I continue to traipse out to the Regional Market each Saturday morning--usually in hot pursuit of my weekly must-haves. I like to call them the 3Bs--bread, biscotti, and beef/bison. When the pantry and freezer begin to empty out I add other letters of the alphabet--C-- for chicken, cereal and cheese--you get the idea. I was not on an "alphabet expansion" trip when I stumbled across R&G Cheese Makers but there they were, in plain sight in the "A" shed--on the opposite end of the shed from where I find my other cheese-making friends. 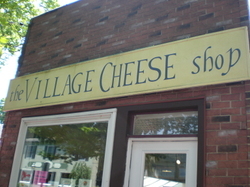 I can't even tell you much about them except to say that they are based outside of Utica and that their maple-chipotle goat cheese is worth checking out. I couldn't resist the flavor profile and picked it up figuring I could use it on some appetizer for a holiday potluck. Not happening--because it will be gone before the next round of parties. I spread some on a beautiful crusty slice of Rock Hill Bakehouse's raisin pecan bread and it was the quickest snack I conjure up on an overcast wintry day filled with errands. R&G has got the sweet/heat thing balanced just right so that neither the maple nor the chipotle overpowers the creamy, slightly tangy goat cheese. I imagine that this particular flavor (they also have plain and a few others) would be perfect stuffed in chicken breasts and pan-grilled. Yum. If you check them out, post a comment and let us know what you think. It used to be that cheese was a relatively simple affair--at least it was in the world I grew up in. There was mozzarella for pizza, cheddar for mac and cheese, and parmesan--Kraft, in the familiar green canister--for the spaghetti and meatballs. My life changed, in more ways than one, when I spent the summer of 1996 in Syracuse doing an internship as part of my preparation for ordination to the Episcopal priesthood. My hosts, who gave me a place to live for the summer, were the Radke family. It was a dreamy summer filled with conversations about art, religion, and food. Nancy Radke is known to some as the co-author of the Dinosaur Bar-B-Que cookbook but she is most famous for heading up the American information office for Parmigiano-Reggiano cheese. If there is anything to be known about this amazing cheese Nancy knows it. She is a gifted communicator and educator and so I spent a summer at her elbow learning how to cook and enjoy Parmigiano-Reggiano cheese. 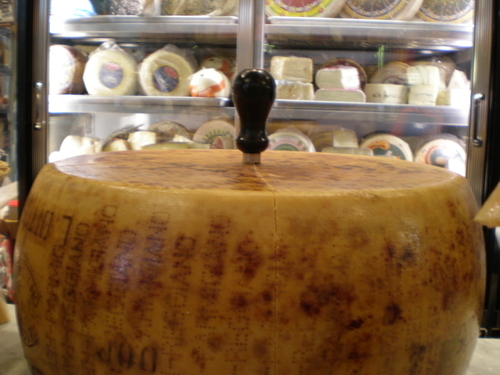 I learned (but have not mastered) how to cut a wheel of Parmigiano-Reggiano. I savored slivers of Parmigiano kissed by droplets of 40 year-aged balsamic vinegar. I enjoyed Parmigiano-Reggiano cheese on nearly everything and learned how to take the rind and dice it up to flavor stock for Italian soups. After spending a day running around NYC to purchase Parmigiano-Reggiano cheese for a special breakfast Nancy was hosting during the week of New York's Fancy Food Show, I've come to understand how little know I know about this rather complex cheese. 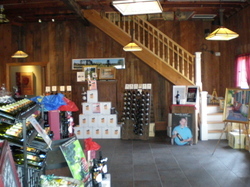 Living near the Finger Lakes means that it is fairly easy to score a local wine. Even if I can't find my favorites at the wine shop, strategic planning means that in an afternoon I can usually hit one of the lakes and pick up the juice straight from the vineyard. Finding other New York wines, however, is as different story. Until a few years ago I didn't know much about the other wine regions in our state and I was fairly happy to live in ignorant bliss. 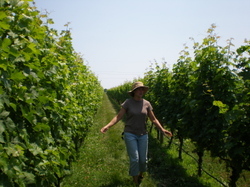 But one of the first food and wine blogs I began reading regularly was LennDevours--covering New York State wine and food. Lenn opened me up to the possibility that the Finger Lakes didn't have the monopoly on good wine in the Empire State and it was many of his tasting notes that got me to visit Channing Daughters in Bridgehamton. I loved them so much that I joined their wine club. 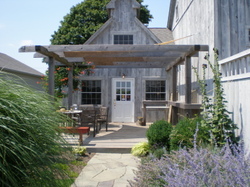 So once a year (should be more, I know) when business brings me down to Long Island I make a stop at Channing Daughters but this time around, I added an overnight, brought a friend, got a killer itinerary from Lenn and set out for 24 hours of East End wine tasting. 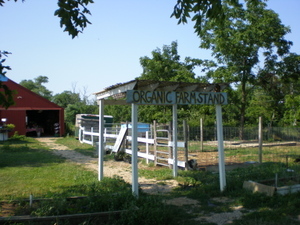 The first day was pretty simple, check out Channing Daughters, explore Sag Harbor and have dinner, and rest up for a full day on the North Fork where most of the Long Island wineries are located. So here are some photos with commenetary of the first day. Following posts will detail all the new places that Lenn introduced me to. 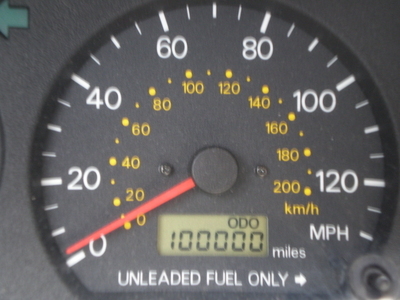 My beloved and trusty car hit its 100,000th mile just as we entered Water Mill--not too far from Bridgehampton. 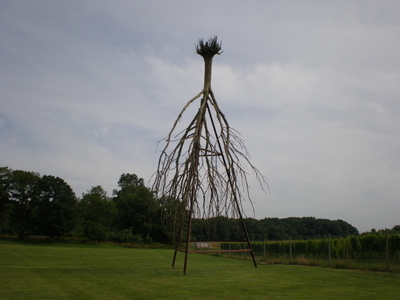 The Channing Daughters vineyards offer a whimsical mix of outdoor sculpture among the vines. An image of this upside down tree graces many a Channing Daughters wine label. 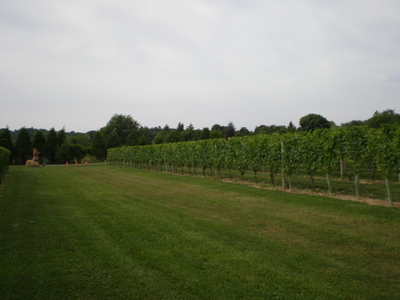 Okay, if I'm not going to show you any wines I should at least post a photo of the vineyard. Since I was the driver of the day I didn't really taste much at Channing Daughters--in fact, I had just received a shipment the day before I headed down to the winery. Tomorrow: How I fell in love with Mattituck. If it looks like a duck and it...oh wait! Yesterday's mystery item yielded some great guesses--many of which were partly correct. But I have to give it to Jill for suggesting a cat-shaped fruit roll up! It took me a minute but after staring for awhile, the cat image jumped right out. 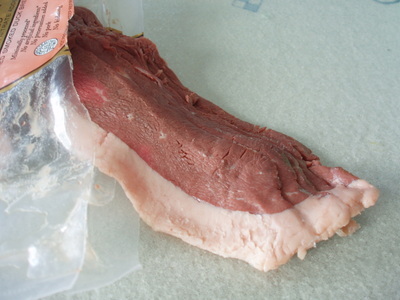 However, those of you who guessed bacon were very close. This is what duck bacon looks like after it has been sizzling for five minutes. 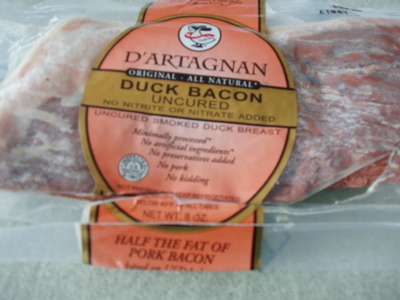 Now, y'all know how much I love bacon so I couldn't resist picking up this D'artagnan Duck Bacon from the Co-op. I'd actually forgetten it was in the freezer until the other day. So with about a pound of lamb riblets (more on those tomorrow) to cook up I knew it was time to bring it out. Even though it looks like a fruit roll up when it is cooked--it is as tender as can be and it tastes awesome! This bacon is not salty but you won't get that crisped edge of bacon fat that you can get with pork bacon. As you would expect, it tastes delightfully like duck. I could see eating this with poached eggs and toast but yesterday I used the rendered fat to saute my carrots and onions for the lamb riblets and then diced up the bacon to flavor the pot. Duck bacon will probably work in any dish that calls for bacon but I don't think I'd recommend them for cookies. Stick to pork bacon for that. 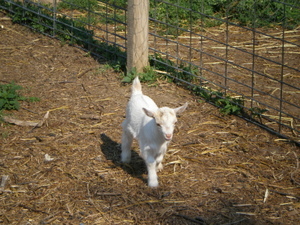 D'artagnan also makes duck proscuitto--you just know I've got to get my hands on some! With my great love for our local Consilvio's pasta sauce I haven't been in the habit of trying new bottled sauces. However, while cruising the aisles of a Whole Food Market last month, a row of jars caught my eye. 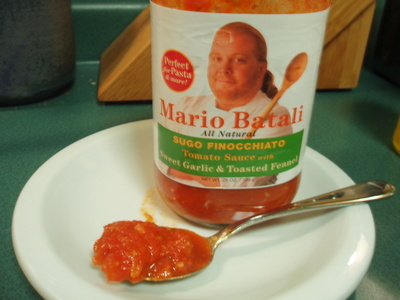 Mario Batali is one of the celebrity chefs that folks love to love. Many say he is the best thing on the Food Network for those who really like to cook--I can agree with that but I do love Ina Garten too. Anyway Mario, like other celebrity chefs, not only has several restaurants and cookbooks to his credit, but has recently expanded into the area of more widely available products like salumi and his new line of pasta sauces. Now, lots of good folks have been inclined to put their names on jars of pasta sauce--but this one is truly worthy of the celebrity name. First of all, you can eat this with a spoon. This is a pasta that really sticks to the pasta because the ingredients are real and substantial. Real slivers of carrots, fennel seeds, onion, garlic, and tomato chunks make this a sauce you could pass off as made from scratch. The garlic and fennel taste really fresh and maintain their distinctive flavors--there's nothing muted about this sauce. If you've ever wondered what the phrase "flavor exploding with every bite" really means--this is the sauce to explain it. Lastly, one of my personal tests of an outstanding sauce is the length of time it spends in my fridge. And note, my husband is allergic to tomatoes so this is just me. Sometimes I find jars of half-eaten sauce hiding in the back of the fridge weeks later. This jar was gone in five days. My favorite quick dish: grilled D'artagnan Rabbit and Ginger sausage, sliced, warmed in the sauce and served on penne pasta with shavings of Parmigiano-Reggiano. Molto Mario indeed!